For clean, pure and silky pool water, just add salt. Your pool is your backyard oasis. Now, you can turn it into a spa-like experience with crystal-clear water that feels smooth and silky to the touch. With the IntelliChlor® Salt Chlorine Generator from Pentair, ordinary table salt is converted into pure chlorine safely, effectively and automatically. You’ll be able to see and feel the difference. Pure Chlorine. None of the Drawbacks. No more bleached out bathing suits. Choose from one of five sanitizing levels. Push the button and you’re done. Automatic reverse cycling helps prevent scale buildup. And, unlike its competitors, electronics are isolated in the cell, away from high heat components—for longer cell life. Available in four model sizes to fit the chlorine needs of any pool. Your Pentair dealer will help select the perfect fit for your pool. Seamlessly interfaces with Pentair automation systems. 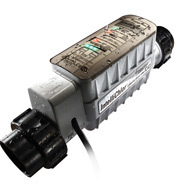 If adding automation and a chlorine generating system at the same time, opt for a Pentair IntelliTouch® or EasyTouch® Control System with built-in IntelliChlor for ultimate convenience and savings. Automatically converts common table salt into all the pure chlorine your pool needs—simply, effectively and safely. Creates clean, crystal-clear water that is soft, silky and smooth to the skin. Eliminates the need to buy, store and handle chlorine. After the chlorine has disinfected your pool, it reverts back into salt and the cycle repeats. Electrolytic chlorine generation is the most convenient way to keep your pool clean. Simply adjust the control to achieve the optimal level of chlorine. 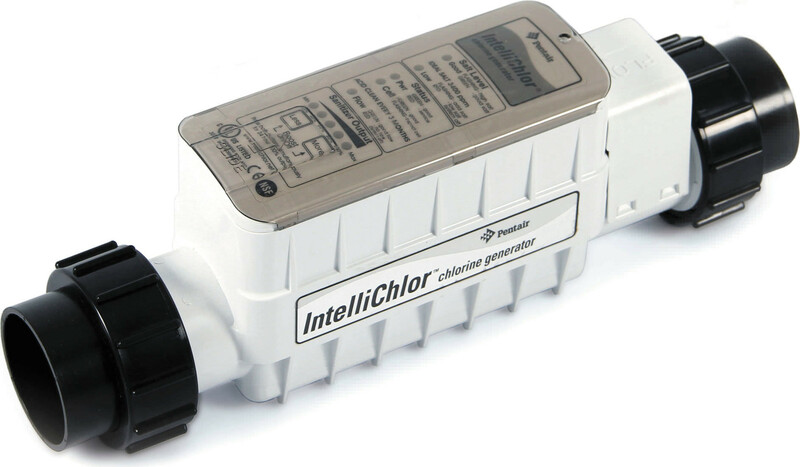 IntelliChlor does the rest, automatically producing a steady stream of pure chlorine to help keep your pool water clean, clear and free of bacteria and other contaminants. What could be easier? The IntelliChlor Salt Chlorine Generator has earned the Eco Select brand distinction as one of the “greenest” and most efficient choices from Pentair. 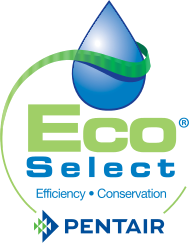 Eco Select products are designed to help you save energy, conserve water, eliminate or reduce noise, or otherwise contribute to a more environmentally responsible equipment system.